1-1.5” [2-2.5 cm] negative ease recommended. Thanks, Space Cadet Yarn, for providing the yarn for Lollipop Forest! And because they’re just fabulous to work with, they’ve also created kits for Lollipop Forest as well! 26 sts and 36 Rounds = 4” [10 cm] in St st worked in the rnd after wet blocking. 22 sts and 64 Rounds = 4” [10 cm] in brioche rib worked in the rnd after wet blocking. Brk1: brioche knit 1 (knit into slipped st and its yo ‘shawl’, as in a k2tog). Brp1: brioche purl: purl slipped st and its yo ‘shawl’ together, like for a p2tog. Sl1yo: move yarn to front, slip st from LN to RN pwise, bring yarn over needle and to the back if working a k st next or all the way back to the front if working a p st next. 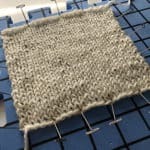 2-st brioche inc: knit into slipped st and its yo ‘shawl’, yo, and knit into same st again (2 sts inc). 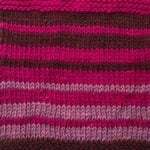 4-st brioche inc: knit into slipped st and its yo ‘shawl’, *yo, knit into same st again, rep from * once more (4 sts inc). 4-st brioche dec: slip next 2 sts from LN to RN (slipping brioche st with its yo), k next st, move st just knitted to LN, pass second st on LN over first st, move st on LN to RN, pass second st on RN over first st, move st to LN, pass second st on LN over first st, move st back to RN, pass second st over first st (4 sts dec). BrRsl dec: brioche right-leaning decresae: slip next brioche st (slipped st and its yo ‘shawl’) to RN, k next st, pass slipped st and its shawl over st just knitted, place this st on LN, pass second st and its shawl over st on end of LN, replace st to RN (2 sts dec). BrLsl dec: brioche left-leaning decrease: slip next brioche st (slipped st and its yo ‘shawl’) to RN, k next 2 sts tog (including the yo ‘shawl’ with the 2nd st on LN), pass slipped st and its shawl over st just knitted (2 sts dec). There are some helpful video tutorials for these increases and decreases here. Given these socks are toe-up, they avoid the challenge with Brioche stitch and a cast-on that isn’t stretchy enough. Written directions are given for the Right sock Instep only. Given the charts are a bit large (not hard – just very detailed), we’re giving you a PDF of each size. With MC, CO (8, 10, 12) sts on each needle using Judy’s Magic CO; (16, 20, 24) sts total. Rnd 2: *K2, kfb, k to last 3 sts on needle, kfb, k2, rep from * on second needle; (20, 24, 28) sts. Rep Rnds 1-2 (6, 7, 7) times total; (40, 48, 52) sts. Size S: *K3, k2tog, rep from * to end; 32 sts. Size M: *K3, k2tog, rep from * to last 4 sts, k1, k2tog; 38 sts. Size L: *K3, k2tog, rep from * to last 2 sts, k2; 42 sts. Setup Rnd 1: With CC, *sl1yo, p1, rep from * to end. Setup Rnd 2: With MC, *brk1, sl1yo, rep from * to end. Rnd 1: With CC, *sl1yo, brp1, rep from * to end. Rnd 2: With MC, *brk1, sl1yo, rep from * to end. Rep Rounds 1-2 22 times, then rep Rnd 1 once more. Begin Brioche Lollipop Pattern (Right Sock) from chart according to sock size or written directions. Rnd 1: With MC, brk1, sl1yo, brRsl dec, sl1yo, 4-st brioche inc, sl1yo, brLsl dec, sl1yo, *brk1, sl1yo, rep from * to end. Rnd 2 and all even rnds to 16: With CC, *sl1yo, brp1, rep from * to end, working a p1 in every yo from the 4-st brioche inc.
Rnd 3, 7, 11, 15: With MC, *brk1, sl1yo, rep from * to end. Rnd 5: With MC, brRsl dec, sl1yo, brk1, sl1yo, 4-st brioche inc, sl1yo, brk1, sl1yo, brLsl dec, sl1yo, *brk1, sl1yo, rep from * to end. Rnds 9 and 13: With MC, 2-st brioche inc, sl1yo, brk1, sl1yo, 4-st brioche dec, sl1yo, brk1, sl1yo, 2-st brioche inc, sl1yo, *brk1, sl1yo, rep from * to end. Rep Rounds 1-16 until foot measures (6, 7, 8)” [15, 18, 20 cm], or until 2” [5 cm] shorter than desired length, ending with an even round. With MC, work next odd Brioche Lollipop Rnd across instep. You will now transition to St st for the heel and will leave the brioche on the instep to continue once the heel is complete. Size S: *Kfb, k3, rep from * to last st on needle, turn; 20 sts on heel. 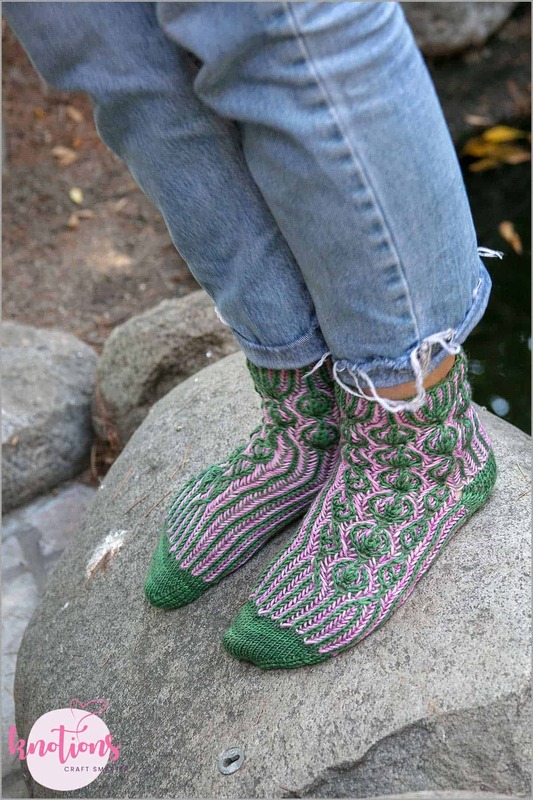 Size M: *Kfb, k3, rep from * to last 3 sts, kfb, k to last st on needle, turn; 24 sts on heel. Size L: *Kfb, k3, rep from * to last 5 sts, kfb, k to last st, turn; 26 sts on heel. Row 1 (WS): DS, p to last st, turn. Row 2 (RS): DS, k to DS, turn. Row 3 (WS): DS, p to DS, turn. Rep Rows 2-3 until there are (6, 8, 9) DS on left side and (5, 7, 8) DS on right side, with 9 sts in center of heel, ending with WS Row 3. Row 1 (RS): DS, k to last DS, pm before DS, turn. Row 2 (WS): DS, p to last DS, pm before DS, turn. Row 3 (RS): DS, k to 1 st before DS, turn. Row 4 (WS): DS, p to 1 st before DS, turn. Row 1 (RS): DS, k to m, rm, k1, turn. Row 2 (WS): DS, p to m, rm, p1, turn. Row 3 (RS): DS, k to DS, k both legs of DS together, k1, turn. Row 4 (WS): DS, p to DS, p both legs of DS together, p1, turn. Rep Rows 3-4 until 3 sts rem at each end: 2 DS and 1 edge st left unworked. Next Row: K across needle with heel sts. Size S: *K2tog, k3, rep from * to end; 32 sts total. Size M: *K2tog, k3, rep from * 4 times, k2tog, k1; 38 sts total. Size L: *K2tog, k3, rep from * 5 times, k1; 42 sts total. Work in patt to end of Rnd 16 of Brioche Lollipop Pattern. Then work Rnd 17 of chart to transition to full cuff pattern. 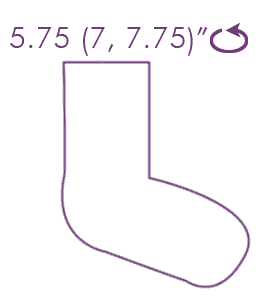 Begin Cuff chart for Right sock and work until 1” [2.5 cm] shorter than desired length. Work Brioche Rib as above for 1” [2.5 cm]. With MC, BO all sts loosely, working a brk1 in every sl1yo and a p1 in all brp1 sts. 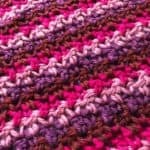 Follow instructions for Right Sock to Brioche Lollipop Pattern, working Left sock charts as for size. Wet block lightly to measurements. 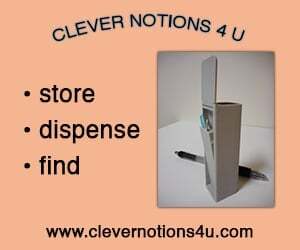 Emily Connell is an instructor and designer in Baltimore, Maryland. She likes to design sweaters in particular, but also, more recently, shawls with intriguing constructions and clever techniques. Short rows, stripes, and lace are her favorites.